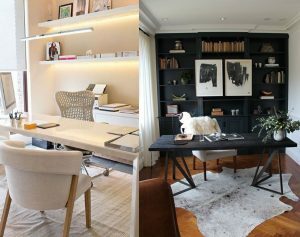 When it comes to home offices, there are many things to consider, but ultimately the space needs to be a functional, inspirational room where you can pull up to your desk and clock some serious work hours. 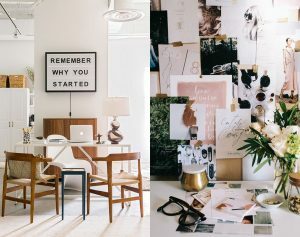 Whether your home office is your primary work space, or serves as an occasional remote work location from your job, there are so many ways you can make your space work for you and your specific needs. Speaking of which, unless you happen to share your home office, most of the time you have the luxury of designing the space with yourself in mind. The first priority in any home office is to ask yourself how much work space do you need? A writer might need less desk space when compared to an architect who needs space for large scale floorplans. This will help determine the best layout for your home office. Function has to trump form here, but that doesn’t necessarily mean that you have to sacrifice style. 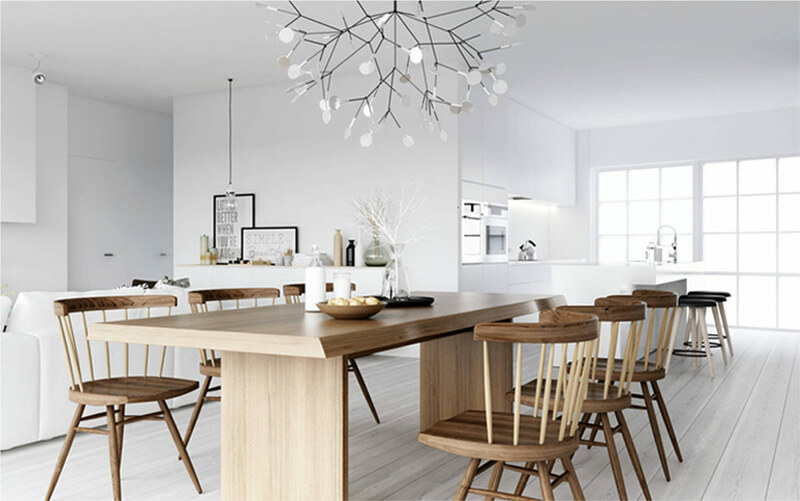 Your space can both be functional and fabulous if you approach design the right way. When it comes to layout, I almost always recommend to face your desk towards in the door — I like the flow it creates better but you also are able to see when someone enters the room. While I realize that might not always be possible for your space, if you are able to do it, do it! Next on my list of top priorities – the all important desk chair. I can’t stress enough the importance of finding a good, comfortable chair that you can sit in comfortably for hours on end. Take your time to do the research to make sure you get a chair that fits your specific needs. There are tons of websites, such as this one, where you can look into various chairs, but it is also beneficial to stop into some showrooms and sit in the chair. Now that you’ve got your chair and your desk, its time for the fun things. Be surrounded by things that inspire you – specific to your trade and skill set. Things that inspire you to work harder, remind you of why you’re working, or inspire your actual work. I love inspiring art, motivational quotes, or photos of people that inspire you. For my personal desk, I have a few essentials that are always in my space. A framed photo of my family is something that is essential, a post it note with my income goal for the year, and my favorite candle. There is something so motivating to me about having my goals written in a tangible way. 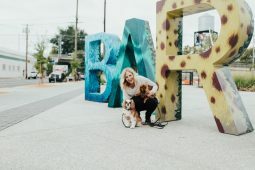 It is a constant reminder to push myself and my business to meet the goals that I have set — which often are a bit crazy. My candle obsession is no secret either – I have so many candle favorites but I always have one that I can light to fragrance my space and give me a sense of calm. 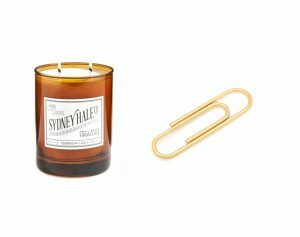 A new favorite of mine is Sydney Hale Co., which has amazing candles and supports local animal rescue foundations (a cause so near and dear to my heart). Another little favorite of mine that brings me joy is this jumbo gold paper clip – it’s ridiculous and I love it. Natural sunlight is always a win. If you have big, beautiful windows it will bring your space to life. Other ways to bring light and life into your space – fresh flowers or house plants! Having a well stocked desk brings peace of mind as well as heightened productivity. Speaking of which, I am absolutely obsessed with this particular pen. I love it so much that I had KSID branded pens made for my office. 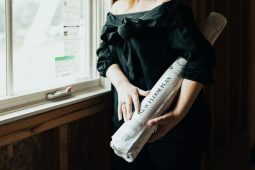 It’s the little things, and when you take the time to have every detail be beautiful, it inspires you and brings joy while you work. An essential part of any functioning home office is organization. You know what they say – a cluttered desk is a cluttered mind. I hate to be cliche, but it is so true. Other than inspirational pieces, avoid filling your space with things that serve no purpose. Come up with a filing system that is practical and makes sense to you. Eliminate visible wires if possible, try to consolidate. Is wireless an option? These little changes will help the overall functionality. A must for me is to have a spare set of chargers in my office, this way I am always set up to have a charged computer, iPad, iPhones, etc. I don’t know about you, but all of this talk makes me want to do a serious stationary haul and reorganize my office. I hope you learned a thing or two about how to maximize your space today! If you’d like to carry on with the inspiration, I love browsing Poppin’s website for all things related to offices and organization. 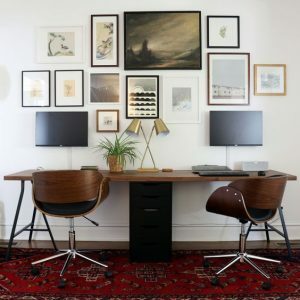 And if that’s not enough, head over to our home office Pinterest board to see what other home offices we are crushing on. Until next time!